Well, yes; we want to be seasonal, don’t we? And yes, there are linkages to be made. A brief Internet search on the subject yields two main narratives: Thanksgiving as an opportunity to talk about climate change and agriculture (as in turkeys could get more expensive as feed prices rise because of recurrent drought); and Thanksgiving as an opportunity to talk about communication (as in what you have to do with your climate-skeptic relatives). These are excellent points and I’m not going to try to make them all over again. Have you ever thought it strange that we give thanks by eating a lot? If anything, American Thanksgiving sometimes seems more a celebration of greed and gluttony, with a perfunctory discussion of life’s blessings sometimes thrown in among the other topics of discussion at the dinner time. And yet, there is one thing that being surrounded by more food than one could possibly eat is good for; it brings home a sense of bounty, the reassurance that, no matter what, there will always be enough. And that is something to be thankful for. It’s an illusion, of course. There is no such thing as an infinite resource; use enough of anything for long enough and eventually you will run out. Even renewable resources are only sustainable if you use them slowly enough that they can replenish themselves. We know from sad experience that it is indeed possible to run completely out of precious things that once seemed all but limitless. Passenger pigeons, for example. Ever more efficient harvesting techniques hide the extent to which our fisheries are depleted. Expensive extraction procedures, like deep-sea oil drilling and tar sands mining, are now economically competitive–the more accessible oil is mostly already gone. 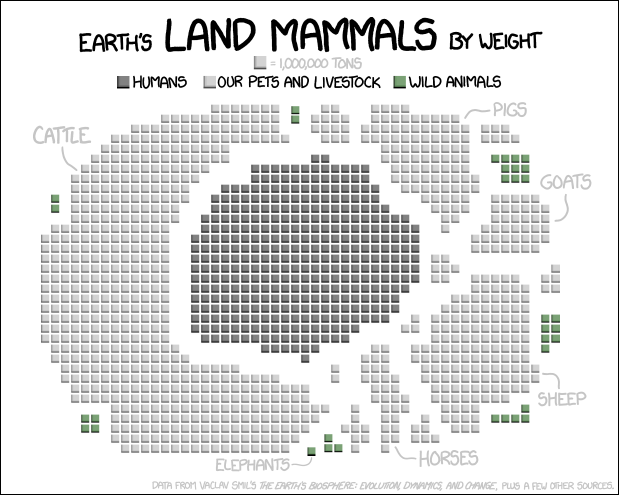 It’s not necessarily that humans don’t have enough food and water. As a general rule, famine is a distribution problem, not a production problem (so far). But we no longer have abundance, a planetary Thanksgiving table groaning with reassuring excess. 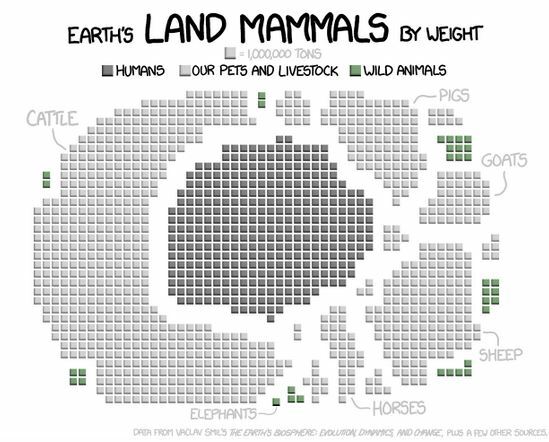 Humans already use more than the entire ecological product of the entire planet. That is possible because we are, in effect, spending planetary capital, reducing Earth’s total richness a little more every year. I’m not trying to be gloomy for the sake of gloominess, I’m talking about the physics of the environmental crisis, the details of how the planet works. I’ve gone into detail on this before, but the basic idea is that the planet has an energy budget and that when part of the planet (e.g., us) exceeds this budget, the planet as a whole destabilizes. The biosphere actually shrinks and loses diversity. One way to describe global warming and all its awful permutations is as a complex system being pushed into an entropic state. The bottom line is that there is no way to sustainability that does not involve radically reducing our resource use–and the longer we put off doing so, the more stringent a budget our descendents will have to keep. We got into this mess by treating the entire planet as a Thanksgiving feast that would never end, but the feast is over now, and has been for a long time. Real, literal feasts are never actually about unlimited consumption. We know perfectly well that the Thanksgiving table may groan, but it’s not actually infinite. It just feels reassuringly infinite, and it is that feeling that is important. The illusion of physical abundance is a needed reminder of the truth of spiritual abundance–which is the actual point of the holiday, the thing we’re actually remembering to be thankful for today. The psychological power of the illusion of abundance does not depend on vast resources, something families of limited means understand well. By saving up and looking for deals and cooking skillfully, it is possible to produce a sumptuous feast that feels abundant and actually sticks within a fairly modest budget. The spiritual value is accomplished, and nobody goes into debt. That’s what we have to do as a species. We have to find a way to live within our ecological means–the first step is to get off fossil fuel–and yet work with what we have so skillfully that what we have feels like more than enough. By staying within a budget we can stop worrying about running out–a paradoxical but very real form of abundance. Then the planet will have a chance to heal. The biosphere will grow again. And it is possible, just possible, that our descendants will live to see a more bountiful feast than what we have. Categories: Climate Science, Climate Solutions, Uncategorized | Tags: anti-entropic, climate change solutions, complex systems, ending global warming, entropy, science explainer, second law of thermodynamics, thanksgiving | Permalink. I know a lot of climate deniers have written about climate change having paused or stopped about eighteen ago. I know a lot of reputable science writers and even scientists have tried to explain the pause away. Nevertheless, there is no pause. The basic outline of the story is that since 1998 land surface temperatures have not warmed as quickly as the overall warming trend would suggest and that climate scientists have struggled to explain the discrepancy. Over the past year or so, several dozen explanations have been put forward as to where the missing heat has gone, but they still don’t know which of these explanations is most important. Climate deniers are delighted. This outline is true in much the same way that, as of the year 1790, the United States had never had a worse President than George Washington. To unpack how the “pause” narrative is so misleading,we have to look at several interrelated points*. The first, and maybe most important, is that 1998 was a really hot year–it had a strong El Niño. Choosing an unusually hot year as a starting point creates what looks like a 15 year period of slowed warming. Start the fifteen year period in 1996 instead, and you get a decade and a half of unusually fast warming. In the years where the two periods overlap, from 1998 to 2010, was the planet warming both slower and faster than normal at the same time? The fact is that fifteen years is too short a period to study climate. It’s like trying to catch the changing of the seasons by looking only at fifteen days in March–it’s not enough time for the underlying warming trend to show itself through surface variation. Climate scientists seldom pay attention to blocks of time shorter than about thirty years. Another important point is that, even given 1998 as a starting point, global warming has not stopped. Writers who say that is has are either making a mistake or deliberately lying. What the globe has done is warm more slowly than some people expect. There is a big difference between slow change and none, as anybody going broke gradually can tell you. Presumably, at least some of the “global warming stopped years ago!” articles are deliberate lies. There are certainly climate skeptics who are just not convinced yet for whatever reason–I’ve written already about how and why they deserve respect–but true climate deniers, people with an investment in sowing doubt, do sometimes lie. But while the popularity of the pause narrative might well belong at the deniers’ footsteps, even the most cynical cannot blame climate denial when scientists themselves write about the pause as though it were real–as they do when trying to explain where the “missing” heat went. The explanation here is two-fold. First, scientists like to push the envelope. So, fifteen years is too short a period to study with any reliability–but some people want to study it anyway. They know that short-term variation really has nothing to do with climate change one way or the other, but they still want to explain the variation. Second, climate scientists are not immune from the siren song of the media, even though many of them are really bad at responding to that song. When the public started talking about the pause, some scientists and science writers figured they’d better talk about the pause, too. In the Spring of 2013, The Economist published an article that referred to the pause or “hiatus.” The article did not directly question climate change as a whole, and its overall point was not that the so-called pause meant that we shouldn’t take the problem seriously. Instead, the author used the recent couple of relatively normal years as a starting point for a fairly intelligent discussion of some of the things scientists don’t know yet about the climate. For example, volcanic ash can lower global temperatures by blocking the sun, but large eruptions can also change global air circulation patterns in ways that might warm the planet. So, when a large eruption happens, does that make things better or worse as far as global warming goes? Nobody knows yet. Although the author failed to make clear that a slow couple of years is not really significant and generally underestimated the severity of the problem, the article did correctly point out that all this uncertainty is not good news. After all, if it’s possible climate change could be milder than initially predicted, it’s also possible it could be much worse. But despite its measured, detailed intelligence, the Economist article drew attention to the idea of the pause and got the public talking about the possibility that global warming had stopped. The IPCC was, at the time, finalizing the language of the first installment of its Assessment Report 5 and some in the committee evidently felt that the groundswell of talk meant they should respond in some way. An early draft of the report pointed out that fifteen years is really too brief a period to matter, but that the slowdown wasn’t explained by any of the models. When the draft was leaked to the press, the media took this language as an admission of incompetence and ran. By the time the IPCC had corrected its language so it was less easy to misunderstand, the damage had been done. A final irony was that the mystery of the “pause” had already been solved; once the models were updated with additional data, they reproduced the slowdown just fine. But the IPCC collects papers for its reports only during a specific window. Once that window closes, no new work will make it into the report. And the solution to the “slowdown” mystery came out after the window shut. The IPCC’s draft report acknowledged a mystery that not only did not matter but actually no longer existed–but when scientists tried to set the record straight, it looked to some like the so-called alarmists were backpedaling. The pause narrative probably isn’t going to go away. Or, rather, it will eventually be superseded by some bauble more enticing to the public eye, but the climate deniers who use it are not going to stop and issue retractions just because I, or anyone else, writes an article on the subject. Climate denial is not, fundamentally, about a dearth of correct information. But what an article like this can do is push back a little–and encourage others to push back–so that the disinformation campaign cannot run around on an entirely open playing field. If every time someone says “global warming has stopped!” someone else nearby says “no, it hasn’t,” maybe that particular nugget will lose its value. *For this article, I drew heavily on one article in Mother Jones, which is where the link attached to this asterisk goes. It might look like I’m making a lot of statements without citing any sources, but really I didn’t want to just link to this one article over and over and over again. Categories: Climate Science, Uncategorized | Tags: climate chance hiatus, climate change pause, climate predictions, IPCC report, media, volcanoes | Permalink.